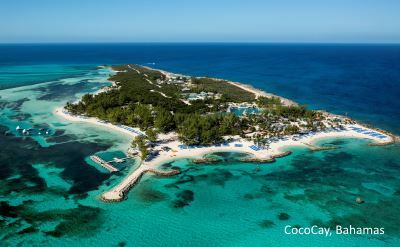 CocoCay is a private island in the Bahamas owned by Royal Caribbean Cruise Line. Many of their Bahamas and Caribbean cruises out of Port Canaveral (Florida) include a stop there. Scroll down for the complete list of cruises to Cococay. The little island is just 140 acres, and is only about 200 yards wide. Cruise ship passengers take a tender to the island playground. This video documents one person's visit to CocoCay. 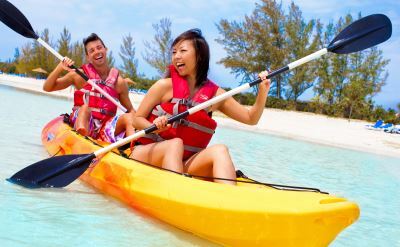 Things to do on CocoCay include riding a waverunner, playing on the floating aqua park, soaring into the air on a parasail, kayaking, walking the nature trail, and snorkeling around the coral reef. Or you can just relax in a hammock or lounge chair and sip a drink. Lunch on the beach is free. 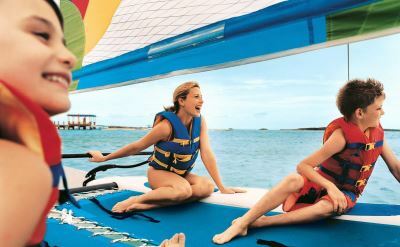 3-night cruises to CocoCay on Royal Caribbean. Round-trip from Port Canaveral to Nassau (Bahamas) and CocoCay (Bahamas). • 2019 departures: March 1, March 8, March 15, March 22, April 5, April 12, April 19, April 26, May 10, May 24, May 31, June 7, June 14, June 21, June 28, July 5, July 12, July 19, July 29, August 2, August 9, August 16, August 23, August 30, September 6, September 13, September 27, October 4, October 11, October 18, October 25, November 1, November 15, November 22, November 29, December 6, December 13, December 20, December 27. 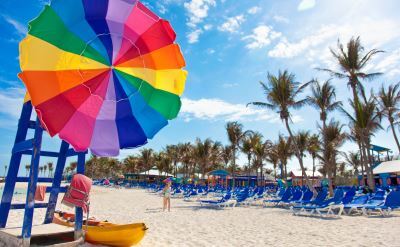 4-night cruises to CocoCay on Royal Caribbean. Round-trip from Port Canaveral to CocoCay (Bahamas) and Nassau (Bahamas). • 2019 departures: March 4, March 11, March 18, March 25, April 1, April 8, April 15, April 22, April 29, May 6, May 13, May 20, May 27, June 3, June 10, June 17, June 24, July 1, July 8, July 15, July 22, July 29, August 5, August 12, August 19, August 26, September 2, September 9, September 16, September 23, September 30, October 7, October 14, October 21, October 28, November 4, November 11, November 18, November 25, December 2, December 9, December 16, December 23, December 30. CocoCay photos are courtesy of Royal Caribbean Cruises. Another source for many more photos of Cococay.